The eligibility requirement in the original NOR has been modified to better reflect contemporary boat design and insurance realities. The minimum legal liability insurance coverage requirement for this regatta has been set at $5million. Planning is now well advanced for the 17th annual running of the Lock Crowther Memorial Regatta Friday 30 September to Sunday 2 October comprising an ocean race for Cat 4 boats and 4 inshore races. 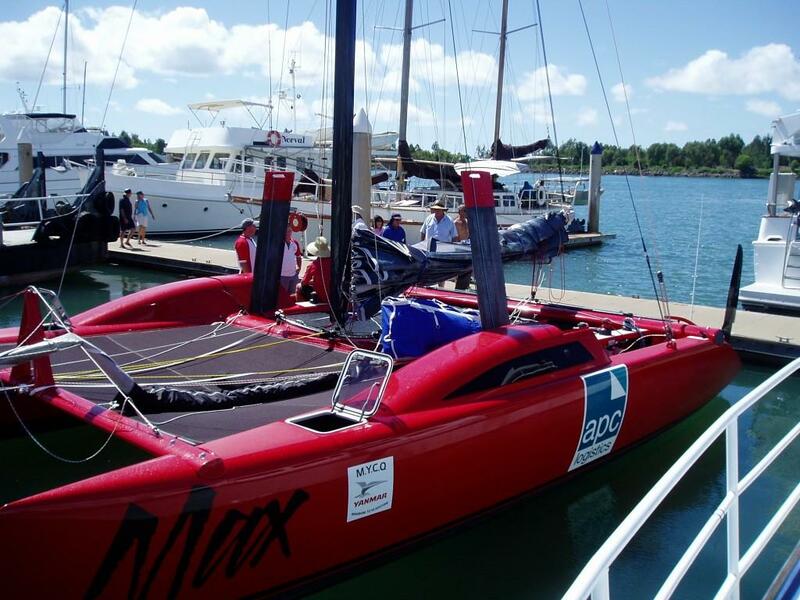 The regatta caters for the keen racer as well as for cruisers and a special drawcard this year will be the participation of Sean Langman's Orma 60 trimaran "Team Australia". More details here and check back soon for the Notice of Race, Entry Form and Sailing Instructions. After one discard, Scud has won the Spring series on 18 points as well as taking out the OMR double. Second, Voodoo Spirit (21 points); third, Twiggy (27 points). Congratulations! Results for Spring Race 7 also posted. Click here and follow the links to full results in the Racing, Cruising, Ocean and OMR series...Photos to follow shortly. After two discards, Zorro has won the Winter series on 19 points. Second, Twiggy (21 points); third, Lukim Yu (23 points). Congratulations! Results for Winter Race 9 also posted. After two discards, Scud has won the Autumn series on 15 points. Second, Lukim Yu (16 points); third, Twiggy (19 points). Congratulations! Results for Autumn Race 9 also posted. After two discards, Nusa Dua has won the Summer series on 14 points. Second, Lukim Yu (21 points); third, Twiggy (24 points). Congratulations! Results for Summer Race 9 also posted. After two discards, Indian Chief has won the Spring series on 21 points. Second, Twiggy (25 points); third, Scud (26 points). Congratulations! Results for Spring Race 8 also posted. Click here for full results in the Racing, Cruising, Ocean and OMR series...Photos to follow shortly. After two discards, Zorro has won the Winter series on 28 points. Second, Twiggy (30 points); third, Scud (33 points). Congratulations! After two discards, Nina has won the Autumn series on 12 points. Second, Zorro (20 points); third, Twiggy (25 points). Congratulations! After two discards, Scud has won the Summer series on 22 points. Second, Twiggy (23 points); third, Indian Chief (27 points). Congratulations!....Summer Race 9 results also posted. Top performing boat. Immaculate condition and presentation. After two discards, Twiggy has won the Spring series on 15 points. Second, Scud (17 points); third, Nusa Dua (21 points). Congratulations!....Spring Race 8 results also posted. "A Bird's Eye View - an update from Big Bird"
Catch this great article by Steve Barton reprinted here courtesy of Multihull World magazine. After two discards, Scud has won the Autumn series on 30 points. Second Zorro (39 points), third Twiggy (43 points). Congratulations! Selected photos from the 2007 Regatta can now be enjoyed.... here. Another fabulous weekend of sailing! Click here for full results in the Racing, Cruising and OMR divisions...Photos to follow shortly. Don't miss this one. Follow the links here for more details. Please click here to download a copy of the Sailing Instructions. Yes, it's on again for the 12th consecutive year and promises to be bigger and brighter than ever! The APC Logistics - Lock Crowther Memorial Regatta to be held on fabulous Pittwater 29th & 30th September. Click here for further details and links to the Notice of Race and Entry Form. Nusa Dua wins Spring Series! We wish to extend our sympathies to the family of John Patrick Partridge who died suddenly on November 1, 2006. John was a dedicated multihull sailing enthusiast who made an enormous contribution to the multihull class over many years, helping to establish both formal support for and active participation in the class on Pittwater. A celebration of John's life will be held at the Royal Motor Yacht Club, 46 Prince Alfred Parade, Newport, on Thursday (November 9, 2006) at 11 a.m. Selected photos from the second day of racing (Sunday 1 October 2006) are now available. A selection of photos from the first day of racing (30 September 2006) is now available for your viewing pleasure. None from the windy Saturday afternoon race though! Click here to see the photos. More coming soon. Another fabulous weekend of sailing! Click here for full results in the Racing, Cruising, OMR and Seawind divisions...Photos to follow shortly. Course 27, GPS distance 11.6 nm approx. Winds S-SE, 5-10 knots. 6 starters, 6 finishers. 1st Mighty Manfred; 2nd Big Bird; 3rd Zorro. High disposable incomes, belonging to prestige organisations, clubs and associations, high level friends and contacts, money to spend, responsive to your message ... sound promising? Our audience could be your future customers. APC Logistics, an Australian based international freight forwarding company, has signed on as principal and title sponsor of the 2006 Lock Crowther Memorial Regatta. In announcing the sponsorship, APC Logistics managing director Tony Considine said "We at APC are delighted to be associated in this way with such a prestige sailing event.....It will also give me the opportunity of competing in APC Max - my modified carbon fibre Grainger design Raider 31 cat - against some tough opposition in such a fantastic location". Now in its eleventh year, the Regatta, hosted by the multihull division of the Royal Motor Yacht Club, Broken Bay, recognises the contribution made by Lock Crowther to the development of the modern multihull.